The XBOX One is beating the PS4 — at least on Facebook, if not in sales numbers. 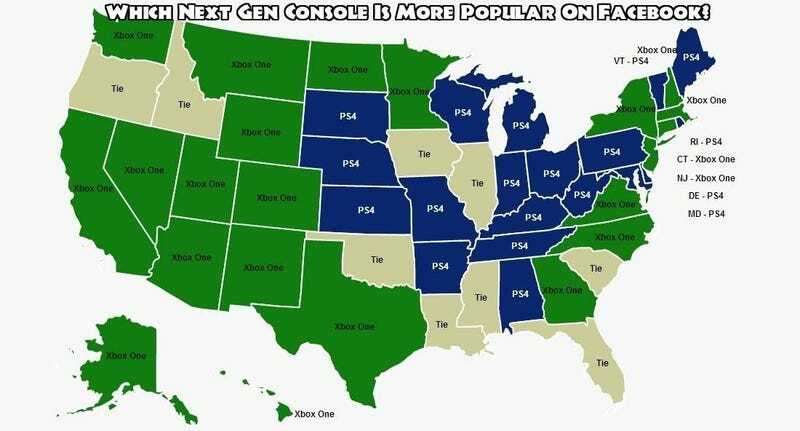 A map published by the Movoto Blog takes a look at the popularity of current-gen consoles in every state in the United States based on the number of Facebook likes. The results are surprising: The XBOX One was the favorite in 22 states versus 19 for the PS4. The caveat here is that different states have different populations. But the XBOX is winning in all the New York, California and Texas — the big ones! Yes, we know it's just Facebook likes. Sales data tells a completely different (and more accurate) story. The PS4, for instance, had sold over 7 million consoles in April, while the XBOX One sold 5. Nevertheless, Facebook has millions of users. That is a sample size that's way better than most other studies. And people who actually hit the Like button next to their favorite console are certainly among the most die-hard fans.